Rumor has it that a powerful sports league has a Championship game on TV on Sunday, February 3, 2019. Due to very strict copyright restrictions by the league management, we can’t tell you what game it is, but we gave it another name using synonyms that are not copyrighted. Please join us and watch the “Superb Crock” game on all our TVs. 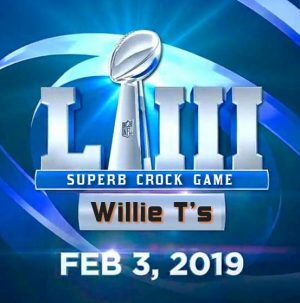 There is no admittance fee or cover charge, and of course we will have superb food & drinks that you may purchase during the game, including a super bowl of Conch Chowder or Nachos. We don’t yet know what the helmets look like for the competing teams (images also copyrighted), but we will also have the Finals Games on TV throughout January. Hope to see you!! !